Eugene M. Arcy was born on December 19, 1946 in Detroit, Michigan to the late Mitchell Arcy and the late Hedwig “Hattie” Arcy Rotter (nee Lechowicz). 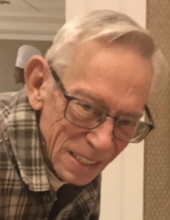 He passed away on February 5, 2019 in West Bloomfield, Michigan at the age of 72. A 1964 graduate of Sacred Heart Catholic School in Dearborn, he made lifelong friends there. He was a kind and loving man who loved the sunshine and fresh air. Eugene will be deeply missed by all those who were fortunate enough to have known him. Eugene was the loving husband of Darlene (nee Kuzewski) who preceded him in death on February 14, 2014. The beloved step-son of George Rotter. Dear brother of Barbara Boyle, Cindy Berry and Annette (Robert) Turner. Eugene was a proud uncle, great-uncle and great-great uncle and will be missed by his many extended family members and friends. The Arcy family will receive friends for visitation on Friday, February 8, 2019 from 3-8 pm and the Lynch & Sons Funeral Home, 340 N. Pontiac Trail (3 blocks south of Maple Rd) in Walled Lake. His life will be celebrated with a Funeral Service on Saturday, February 9, 2019 at 10 am at the funeral home. Friends may visit the funeral home beginning at 9 am on Saturday. Eugene will be laid to rest at Mt. Hope Memorial Gardens in Livonia. In lieu of flowers the Arcy family suggests memorial contribution to the Make-a-Wish Foundation. "Email Address" would like to share the life celebration of Eugene M. Arcy. Click on the "link" to go to share a favorite memory or leave a condolence message for the family.